Figure 1. 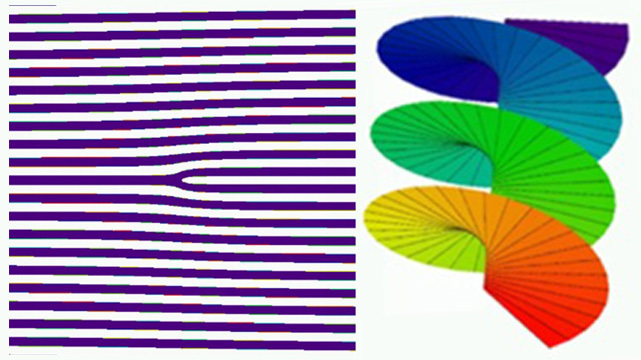 A Laguerre-Gauss beam (right) can be created by running a beam through a irregular grating (left). The beam carries angular momentum and conveys it to the atoms in the BEC. Figure 2. Images made 15 milliseconds after the trap is turned off reveal the difference in configuration. Three years after NIST’s Laser Cooling and Trapping Group made headlines for the first observation of “persistent flow” – frictionless, superfluid motion – of atoms in an ultracold atomic gas, a new set of group members has set a new record. They succeeded in keeping a population of sodium atoms rotating around in a toroidal (donut-shaped) trap for 40 seconds. That’s four times the duration of the original 2007 results, and an extremely long time for a quantum-mechanical effect of this sort. The work is part of a long-term effort to determine the extent to which configurations such as the toroidal superfluid can function like, or provide insight into the behavior of, superconducting quantum interference devices. SQUIDs, as they are known, are capable of detecting vanishingly faint magnetic fields, and constitute a rare instance of quantum effects that are visible in large objects. To obtain the new results, Campbell, JQI Fellow Bill Phillips and colleagues cooled sodium atoms to about 50 nanokelvin (50 billionths of a degree above absolute zero). In that condition, the atoms coalesce into a Bose-Einstein condensate (BEC) in which all of them occupy the same quantum state. All photons have momentum of some sort, and an L-G beam has both linear momentum and angular momentum. “When the atoms absorb a photon from the beam, they are left with both the angular momentum and the linear momentum,” Campbell explains. “Since at the end of the day we only want to leave the condensate with angular momentum, we use a two-photon process, with one Laguerre-Gauss beam and one normal or Gaussian (G) beam. After creating the rotation, the atoms are releasedfrom the toroidal shaped trap and allowed to expand. If the atoms are rotating, then the angular momentum prevents the hole from closing, leaving the inside practically free of atoms much as a hurricane develops a clear “eye.” It is this shape that is the diagnostic signature of the toroidal flow. To confirm and demonstrate that their BEC was actually rotating, the scientists -- including Research Associates Kevin Wright and Sergio Muniz, and Graduate Assistant Anand Ramanathan -- took pictures of sodium BECs both with and without the L-G beams applied. 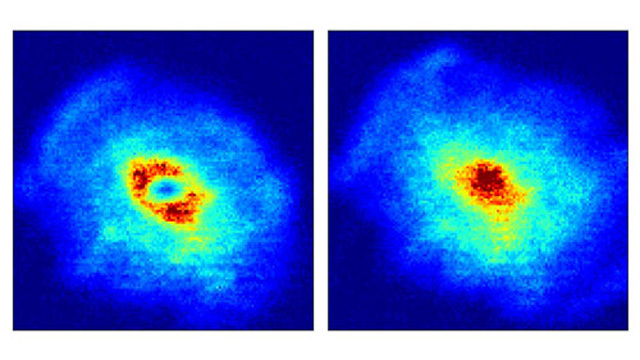 “Time of flight” images taken 15 milliseconds after the trap was turned off and the atoms began to fly apart clearly showed the telltale torus shape in the L-G BEC (left in Figure 2) but not in the G BEC (right in Figure 2).